Our restoration programs are State Water Project (SWP)-funded to comply with the U.S. Fish and Wildlife Service (USFWS) and National Marine Fisheries Service (NMFS) biological opinions for SWP and the Central Valley Project (CVP) operations. DWR and the California Department of Fish and Wildlife (CDFW)’s Delta Fish Agreement offsets adverse fishery impacts caused by the diversion of water at the Harvey O. Banks Delta Pumping Plant, a key part of the State Water Project. Direct losses of Chinook salmon, steelhead, and striped bass are offset or mitigated through the funding and implementation of fish mitigation projects. The Delta Fish Agreement has completed approximately 15 projects in the Sacramento and San Joaquin river basins and in the Bay-Delta area. The FRPA implements the fish habitat restoration requirements of the Biological Opinions in the Delta, Suisun Marsh, and Yolo Bypass. The FRPA is also intended to address the habitat requirements of the Longfin Smelt Incidental Take Permit (ITP). The Fish Restoration Program is focused on restoring 8,000 acres of tidal habitat in the Delta and Suisun Marsh to benefit Delta Smelt and 800 acres of low salinity habitat to benefit Longfin Smelt. These actions will also provide benefits for Winter-run and Spring-run Chinook Salmon, Steelhead, Green Sturgeon, and other native species. The directors of both DWR and CDFW signed the FRPA on October 18, 2010. The Habitat Expansion Agreement required DWR and Pacific Gas and Electric (PG&E) to evaluate and select the most promising and cost-effective actions to expand spawning, rearing, and adult holding habitat for spring-run Chinook salmon and steelhead in the Sacramento River Basin. This agreement provided an alternative to resources agencies prescribing fish passage at DWR’s Oroville Facilities Project and for 2 PG&E projects located in the Feather River System. DWR, CDFW, Reclamation, and the Suisun Resource Conservation District executed the Suisun Marsh Preservation Agreement (SMPA) in 1987 in effort to mitigate water quality impacts (such as increased salinity) in the Suisun Marsh that occurred as a result of the SWP, the Central Valley Project (CVP), and other upstream diversions. To assure that DWR and Reclamation maintain a water supply of adequate quantity and quality for managed wetlands (i.e., duck hunting clubs) within the Marsh. To improve managed wetland habitat and provide high quality foods for wintering waterfowl with the goal of maintaining wintering waterfowl carrying capacity as required by the 1974 Suisun Marsh Preservation Act. 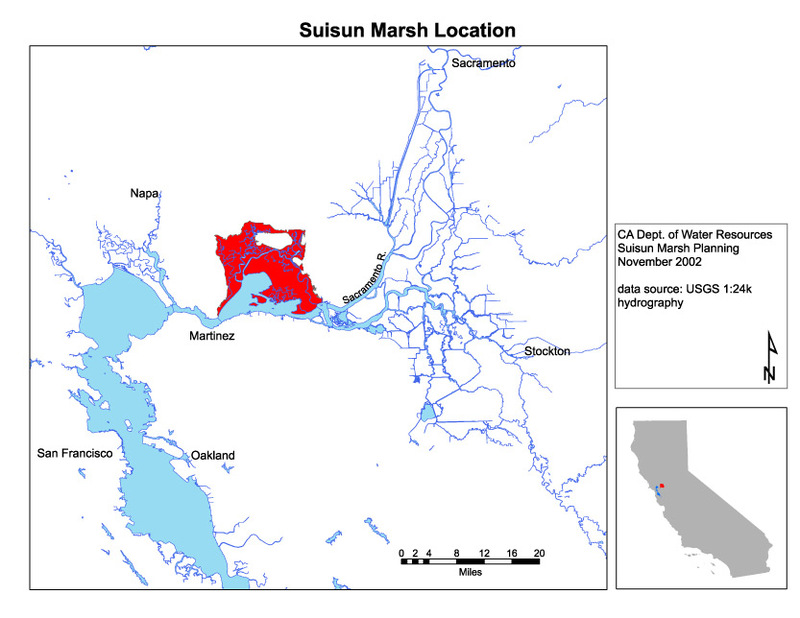 In 2014, Reclamation and USFWS, in partnership with the CDFW and DWR, finalized the Suisun Marsh Habitat Management, Preservation, and Restoration Plan Environmental Impact Statement/Report (EIS/EIR). The goal of the plan is to achieve an acceptable multi-stakeholder approach to the restoration of tidal wetlands and the enhancement of managed wetlands and provide a regulatory framework for operations and maintenance activities on private and public land. The plan calls for 5,000 to 7,000 acres of tidal restoration and 40,000 to 50,000 acres of managed wetland enhancement to benefit wintering and breeding waterfowl. The Department of Water Resources (DWR) and the U.S. Bureau of Reclamation (Reclamation) established the Yolo Bypass Habitat Restoration (YBHR) Program in 2013 to implement the Yolo Bypass Salmonid Habitat Restoration and Fish Passage (YBSHRFP) Project. Originally, the YBSHRFP Project included a suite of restoration actions to achieve compliance with the 2009 National Marine Fisheries Service Biological Opinion (NMFS BO). The restoration actions were developed to carry out the Reasonable and Prudent Alternative (RPA) Actions specific to the Yolo Bypass (e.g., RPA Actions 1.6.1, 1.6.3, 1.6.4, and 1.7) as described in the 2009 NMFS BO and in the 2012 Yolo Bypass Salmonid Habitat Restoration and Fish Passage Implementation Plan. The YBHR Program identifies, evaluates, and implements Yolo Bypass restoration actions that aim to improve floodplain habitat and remove barriers to anadromous fish migration, primarily Chinook salmon and sturgeon. Lisbon Weir Fish Passage Project. Under the purview of California EcoRestore, all of these projects were given specific accelerated construction timelines, except for the YBSHRFP Project.